Pensions are a numbers game. But its not about how much you put away for retirement. You can heavily contribute to an pension investment fund and it can return you very little in the long term – no matter how many tax breaks, frills or top-ups you receive. There is no come-back or guarantee – it’s your loss! There are tax breaks, frills and top-ups there to entice you in to investing in companies which prop up our economy but have no real strategy in providing you with a real long term income that is related to your lifestyle or even your contributions. Property can deliver an income for you, your family and your subsequent family members that is far in excess of what any of the above can do. You may think this is a tall order. But if you take the time to really understand how long term income is created you will realise that what I first say, that pensions is a numbers game, is a true statement and you will laugh at what is currently offered to you as a ‘pension’ from a traditional pension provider. The Government They offer you a state pension. You will get this whether you like it or not. You contribute, via your National Insurance contributions which is deducted at source or, if you are self-employed, deducted from your profits twice a year. The contribution is capped and when you come to retirement they pay a pension currently of around £300 per month. This equates to 9% to 20% of the average UK annual salary depending on where you live in the country. Even though the government offer a debatable value on your contributions, being only £300 per month from full service, a state pension is something we cannot avoid so it’s not worth applauding it or rubbishing it as there is nothing we can do about it! Another incentive they offer is a contribution to a pension fund if you contribute to a pension fund. The contribution is paid by way of not having to pay tax. So if you earn £2,000 per month and pay £200 to a pension company then your taxable income is £1,800 being your income less your pension contribution. If you are a basic rate tax payer, then you will save 21% x £200 = £42 on tax. This is then expressed as an additional contribution by the government as if you didn’t contribute you would have only got £158 out of the £200. So it’s a contribution of £158 from you and £42 from the government. If you’re a 40% tax rate payer the government contribution is even bigger! In the above example it would be a £120 contribution from you and £80 from the government – quite an incentive on the face of it. But what are they allowing you to contribute to? They are not giving you this money to put away or to invest for your future. They are saying you can contribute to something that only the government agrees with – their economy! This has a double effect. Firstly, it means there is investment in the UK economy which helps our UK based economies grow and increase the tax collected from these UK companies. Secondly, it forces the man on the street to take a risk on their retirement income rather than have the government take the risk. If the pension fund doesn’t grow to the desired level then that’s just your misfortune. The government has given you a big incentive to invest in a pension fund but they carry no responsibility if your pension fund is worth zero! To be fair to the government it’s not a bad trade off. They lose anywhere between 21% - 40% of your salary, being tax, to mitigate their risk of having to provide for you in the future. Pension Companies So the government have given you a tax break of up to 40% - what do the pension companies offer you? Well they offer you no guarantees that’s for sure. What they will do however is, take your money, charge you a fee for doing so, invest it in companies that they have no control over and hope to return you an amount greater than a building society would. The reality is that in the last 5 years you’ll be lucky to get any profit at all! The stock market is very risky even if it is managed by a pension company. You’d have been better off investing in a building society or bank. See next section. Please disregard past growth rates of the stock market. Quite impressively the stock market has outperformed every investment out there in the past 50 years apart from the last 10. This is why people have assumed that it is so safe but you must never assume that the past = the future. The stock market has changed dramatically in the way people invest, the type of companies listed, the fluidity in which the market moves and the legislation governing these companies. Dramatic gains are likely to be a thing of the past as most of the gains occurred during the last 50 years. The Banks If I were to recommend a pension fund other than property then I would recommend a good old deposit account with an established bank or building society. If you want to retire with peace of mind knowing that you will have at least something to live on then this is the safest way. The problem is you have to contribute so much to even come close to an income that will match your current salary that it seems an impossible task. There are no tax advantages of following this route and the rates the bank pay are incredibly low that it doesn’t even seem worth bothering. Also if you look at any pension fund they have cash reserves. The trend has been off lately to keep most of these funds in cash – and they charge you an annual management fee to do so! This results in the poor performance of the pension fund due to their charges and the lower returns to be had from cash. You have to ask yourself - why pay a pension company to put your money in to a cash reserve when you can do it yourself and for free! You’ll probably get a better rate than them as well. The only real competitor to a property pension is a pension offered by a pension company. So it makes sense to look into how both these pensions work and how they compare. Can I warn you that the numbers get quite complex if you’re not that numerate. I’ve tried to keep it as simple as possible so bear with me. I guess the reason why so many people have been duped by the pension companies is because of this very fact! It is easy to get blinded by the science. Lets look at a traditional pension. A management fee is the charge a pension company charge to you for managing your money. This seems reasonable from their side as no one would do this for nothing. They invest your money in so called ‘safe’ investments such as cash deposits, bonds and shares. Some pension fund managers are very good at what they do (even though they are an exception) and are well worth their charge as they can out perform the general market. Estimated growth is how much the fund manager thinks he can make your money grow. If current rates offered by building societies are 2.5% then a 5% growth is very attractive as it is double what is being offered from a bank or building society. If you took in to account the tax breaks then it seems even more attractive. These should really be the only 2 figures you should be interested in. These 2 key figures can only ever be the most important figures in the whole pension equation. In fact, these 2 figures are always the key indicators whenever a business person appraises the likely success of a potential investment. A pension fund is an investment so there should be no other way to look at the performance of it. What you put in is totally within your control. Therefore this number is known. It is for you to decide how much you should put away for your retirement. You can be advised on how much you should put away but no one can guarantee what you’ll get out of it. However, you can be assured that most sane people want to put the least away for the most gain. What you get out is totally out of your control. Unless you have taken out a guaranteed benefit pension (which guarantees a fraction of your final salary, usually two thirds) which is hugely expensive and normally only available to executive directors, you will have no idea what your pension fund and thus your annual income will be. You can only ever estimate what you’ll get out with the accuracy of your estimation increasing as you get closer to the maturity date. So in the above traditional pension Joe put in £51,692 and he’s got out £5,119 p.a. He may get £1,000 p.a. or he may get £10,000 p.a. depending on the performance of his pension fund. But at 5% growth rates he has got roughly 10% of his contributions as an annual income, being £51,692 contributions and £5,119 annual income. Now we can’t say that’s good or bad unless we have an alternative to compare to. Now lets look at a property pension. More importantly – what you put in and what you get out. Both have done well but it depends on which time frame you look at. Over 15 & 20 years pension funds win but over 5 & 10 years property win! So it depends on what time frame you look at. The only common thing between these figures are that they all happened in the past. The only people that benefited form these are the people that made these investments. The key to understanding how you can always win with property is to understand the concept of gearing. Or in other words having the ability to borrow. The mortgage market has changed dramatically. It is now possible to buy a property with the lender’s money based on the rental income only. So you are not expected to earn a certain salary to obtain a buy-to-let mortgage of up to £500,000. The only problem is you need a larger deposit compared to the traditional 5% deposit for a residential mortgage. The least you need is 15% deposit but in some cases you need 30%. Due to the introduction of the buy-to-let mortgage house prices have risen way above wage inflation rates. This is because property prices are now determined by the rental value of the home rather than its desirability. So lets look at the cashflows. Jill is 41. She works in an office earning £30,000 per year and is a basic rate tax payer. She decides to build a property pension. She can afford to save £100 per month to build a deposit and buy a property costing £30,000. She can rent it out for £2,400 per year which equates to 8% of the purchase price i.e. 8% yield. She decides to buy a property every time she saves up enough for a deposit. So Jill’s property pension fund is £181,721 being the value of the properties less the mortgage debt. But just like the traditional pension fund we have assumed a 5% growth in property prices. Now, I am not a fortune teller, so I have no idea what the growth rate will be averaged out over the next 25 years. Even though a property pension fund is greater than a traditional pension after tax at the same growth rates (£181,721 v £111,814) - the great thing is that IT DOESN’T MATTER! So with a property pension you actually get money back! What you put in is a negative amount. Your investment in property by way of deposits and fees are replenished by the profits made in property and more. Being prudent, lets assume that the profit just covers the deposit and fees only. This means that over the 25 years what you have put in is still only NIL! So what have you got out of it? Well a nice income of over £10,000 p.a. which is twice as much as what a traditional pension can offer. And this income is not just for your life but for your descendents after your death as the properties pass to your beneficiaries in your will. £144,571 x £45.78 / 1000 = £6,618.44 p.a. What you get out £5,119 p.a. I hope that you can clearly see that property pensions out perform traditional pensions quite astronomically even with all the tax breaks. This is because you essentially put no money in and get more out! Even if the traditional fund did return you a higher income the property pension would win as you haven’t put anything in! This is why traditional pensions are a joke. Flexibility Pensions are inflexible by their very nature, as you can't get hold of your cash until you are 50. And even then its only 25% of the fund. You can sell your property or properties when you want. So if the market is high or you need the cash then the money can be unlocked relatively quickly whenever you want. Longevity Of Income The income from a pension stops when you die. Now this may not be a problem for you (because your dead!) but this could be a problem for your dependents. You can get a pension that pays out to your spouse but you have to pay for it! The annuity rates are much lower. The income streams carry on regardless of your death. Just because you die it doesn’t mean your tenant has to stop paying rent. The rent will simply be paid to whoever you leave the property or properties to when you die. This is how some families have become very rich due to the inheritance of property from their ancestors. Income Now There is no income stream until you purchase the annuity. This may be 40 years after you made the first payment in to the pension fund. When you invest in property you will get income straight away. If you’ve bought the right property then you will get an income even after paying out for the expenses such as the mortgage and repairs. Instinctive How do you choose a good pension fund? Its very hard to choose a good fund. You can use historic data but historic data tells you nothing about future performance. You have to take on the risk that your fund manager will do well with your money. How well he or she will do is impossible to tell. You do not even get the chance to meet them! Its easier to pick a good house rather than a good stock or pension company. You will have an instinctive knowledge about property as we have all lived in one! Its something you can touch and feel rather than a paper statement sent to you once a year! Income rises with inflation If you purchase an annuity with a fixed income payout then you will receive a fixed amount till death. You real income will diminish over time due to price inflation. The only way to counteract this is to take out an annuity that pays an income that rises with inflation. But you’ve guessed it – it costs! So the annuity rates are lower. Rent rises with wage inflation at the very least. However current demographics show that property is in short supply and the situation is set to get worse. Fragmenting families, increasing population, first time buyers being priced out and building quotas not being met will cause rents to probably rise above inflation. Gearing You are unable to borrow to contribute to a pension fund as there will be no way you could service the loan repayments. You are able to borrow because the lender takes first charge on the property and knows you can service the debt from the rent paid by the tenant. The potential growth of your property fund is magnified due to the growth being on the whole property price rather than the actual amount invested. Known retirement income You will have no idea what your retirement income will be. You can only make an estimation but will depend heavily on the size of your fund and the annuity rates being offered at the time of retirement. Its easier to predict your retirement income if you choose properties that give you an income you desire now. So for example if you require an income equivalent to your salary of £2,000 per month then choose 4 properties that have a rental figure of £500 each. Then you can be assured that when you retire the rental figures would have risen roughly with inflation to provide you with a real income of £2,000 per month. No cap on contributions You are capped on the contributions to a pension fund to qualify for full tax relief. You can contribute further but you do lose out on all the tax benefits. Because you have already factored in the lack of tax benefits in the whole equation then the amount you want to contribute is completely up to you. Not relying on growth The fund has to grow to a desired level for you to draw an income sufficient for your retirement. This is very difficult to predict which has been shown by all the pension companies offering these type of pensions. Growth is nice but you are relying on rental income. Rent does not go down – it rises with inflation so you can be assured that the income derived from your properties will be sufficient and growth will be irrelevant. (This is only applicable for a buy & hold strategy). Annuity rates are always inferior to property yields Annuity rates are very poor but will never exceed 8% for someone aged 65. This is because we live longer. In this example if they gave you 8% then they will expect you to die in 12.5 years. This is just under the average life expentancy of 79 being 77.5 years. They will give you an income based on you living till 90 and hope you die at 79! This equates to a 5% rate. 8%+ yields are easily achievable – even though property prices are said to be at an all time high. A list of over 350 areas are listed in the reference chapter that offer an 8% yield or greater. Thus property will always be a better investment than an annuity. Risk & Control You place all the control with a fund manager. He is in full control of your money and exposes you fully to the risks that only he takes on. You take the risks that you want. You are in full control of the decisions you wish to take. You are exposed exclusively to the risks only you wish to take. Now there have been a number of assumptions made in deriving these calculations. These are necessary otherwise we could not build a picture of your future income. Here are a list of the assumptions I have taken for each type of pension, how reasonable they are and how relevant they are to the overall performance of each. Assumption Reasonable? Relevant to performance? Basic Rate Tax Payer I have chosen basic rate as I have assumed most people are basic rate tax rate payers which is the case. In the appendix however, is the calculation for a higher rate tax payer. Yes. A higher rate tax payer gets a higher retirement income than a basic rate tax payer in a traditional pension example but they still receive less than a property pension. So a property pension is still superior. 1% Management Fee There are few if any that charge less than 1% and there are some that charge in excess of 1%. 1% is the industry norm for pension funds. Because this is the industry standard it is a safe assumption as not to distort the figures. 5% Growth of Fund This is a very difficult question as we are crystal ball gazing. We cannot base it on past performance as that is stupid. The key fact is that it is the same growth rate as the property calculations so neither has an advantage. No. As both growth rates were set equal. 4.25% growth in contributions Would seem reasonable due to taking into account inflation and promotional pay increases. No. As we have looked at the contributions in total over the 25 years the individual contributions over the years are broadly irrelevant as in both examples the contributions were spread out. Start age of 41 The start age is not really relevant due to the fact that both pensions were being compared. No. Both start ages were the same. Retirement age of 65 The retirement age is not really relevant due to the fact that both pensions were being compared. No. Both retirement ages were the same. Basic Rate Tax Payer I have chosen basic rate as I have assumed most people are basic rate tax rate payers which is the case. In the appendix however, is the calculation for a higher rate tax payer. Yes. A higher rate tax payer gets a lower retirement income than a basic rate tax payer based on the same contribution level under a property pension but its still in excess of the traditional pension. 8% yield There are many properties and areas that offer an 8%+ yield. I have included a list of over 350 areas in the Appendix. Yes. The higher the yield the higher the profit per year thus reducing your overall contribution. If the yield is 6.75% then the profit over the 25 years matches your contribution to property so that your overall contribution is nil. Below 6.75% yield and you will then have to contribute out of your own pocket. Above 6.75% yield requires no overall contribution. Over 75% of properties on the market offer a 6.75%+ yield so there is no shortage of suitable properties. 8%+ just gives you that comfort margin. Check out the Appendix for the 350 areas that offer in excess of 8%. Fixed Interest rate of 5% APR A fixed rate had to be used to keep the examples simple. Again we are crystal ball gazing here. 5% APR is reasonable because we can fix interest rates to around this level for a period greater than 10 years. Also, fixed rates are determined by the fixed bond market which is less volatile than the variable rate market. Yes. The cost of borrowing affects profits quite dramatically if we don’t buy at a good yield. If you buy a property in excess of 8% then you can weather interest rate fluctuations. You need to consider what you think the average interest rate will be over the next 25 years - and if you know the answer to that then let me know! Interest only mortgage taken out Interest only monthly payments are less than repayment monthly payments thus monthly cash inflows are higher due to the balance never being reduced. It’s a reasonable assumption as all the mortgage companies offer it but it depends on whether you want the property paid in full by the time you hit retirement. Yes. If the example used a repayment mortgage instead of an interest only mortgage then the profit would be the same but the cashflows would have been different. The monetary difference between repayment and interest only could be considered as a contribution. The beauty is that this contribution can be structured as a voluntary contribution if you took out an interest only mortgage and paid the capital off as and when you wished to. Other costs being 20% of rent 20% of rent is quite a generous allowance. This equates to 1 month void period, management fees of 10% of rent and 2% of rent spent on repairs. Yes. The amounts of voids, management charges and repairs affect profit which affect your overall contribution. You need to consider if 20% is enough. Professional Fees I have assumed £1,500 for year 5 increasing by £500 every 5 years. This is a standard charge for valuations, solicitor costs and arrangement fees. Its unlikely that you will face a charge greater than £1,500 and the £500 increase every 5 years is above the rate of inflation so is a prudent estimate. Yes. The size of your contribution is dependent on the amount of professional fees required. The less required means that you can acquire properties sooner as the requirement to purchase a property is lowered. Deposit Level of 15% There are many 15% deposit level mortgage lenders – and to prove it there’s a list in the Appendix! No. 15% is the minimum deposit level required. Since there are many lenders offering 15% deposit level mortgages it’s a fair assumption that its possible to get this type of mortgage. Property purchase price of £30,000 rising by 5% every year. I have chosen £30,000 just as a notional figure to compare like with like based on a rough £100 per month contribution. If a property can only be bought for £90,000 then a contribution of £300 per month is required. No. As the contributions in both examples were the same. So if £90,000 had to be the purchase price then we would have to alter the contributions in the traditional pension example to £300 per month so we could compare like with like. 5% Growth of Property Prices This is a very difficult question as we are crystal ball gazing. We cannot base it on past performance as that is stupid. The key fact is that it is the same growth rate as the traditional pension calculations so neither has an advantage. No. As both growth rates were set equal. Its up to you to think are these assumptions reasonable and/or relevant? Try flexing the numbers to see what other results you get. Do whatever it takes for you to come to a decision on whether what I’m saying has some basis or is fundamentally flawed due to very relevant omissions. Until you do this you will always be waivering between traditional pension funds or property pension funds or even something else! - and always kicking yourself for not making the right decision when one of them booms. So we have established the returns to be had from a traditional pension and a property pension but what are the risks and are they worth it? Lets look at the risks for each one. Fortunately for you I’m not going to ask you to think up all the fears involved, how to overcome these fears and calculate the overall fear factor. I am going to tell you this! Unfortunately for you I am not going to decide for you whether to build a property pension or not because I am not you! However, I will present a very strong case to you and I will recommend that you build one - but the ultimate decision rests with you. With every fear you can take what I call Countermeasures which overcome each fear. A countermeasure is an action you take to counteract each fear. No countermeasure is fool-proof otherwise the fear would not be a fear purely by its definition as it could be fully overcome. There will still always be an overhang of fear albeit a lot less than the starting fear. This is what I call Residual Fear. The residual fear is therefore still present even after the countermeasure and thus is a real fear. You can take further countermeasures to reduce this residual fear but it depends on how far you want to go. There will always be residual fear however. An example of residual fear that cannot be eliminated is the destruction of your property if there was a war. No insurance company will take on this risk. The only way you could mitigate this risk would be to build a bomb proof shell around your property – but this would be impractical and probably cost more than your property itself! 1 Cant find a tenant. Buy a property that can be easily let out, like near a major train station or in a desirable area. Still cant find tenant. Reduce the rent. 2 Interest rate rises beyond affordability Fix the interest rate for a fixed period of time. The interest rate rises beyond affordability after the fixed period of time. Fix the interest rate for the whole term of the mortgage. 3 Get caught in negative equity trap. Don’t sell the property and realise your loss. Continue to rent it out. Wait for the recovery and then sell. It never recovers and you have to sell. Buy the property without a mortgage so that negative equity is not a possibility. 5 Major repair becomes due and can’t afford to carry out works Take out a thorough and comprehensive buildings and contents insurance. The policy doesn’t capture every eventuality. Take out specific policies for specific items i.e. British Gas offer full insurance on your boiler from £8 per month. 6 Buying a property you can’t sell Avoid difficult to sell properties such as studio flats, ex local authority flats, flats above shops, non-standard construction properties or any property that is difficult to get a mortgage on. Still cant sell it! Buy a property near a train station city or major road junction. Calculate the residual fear for each fear applicable. 1 Cant find a tenant. Buy a property that can be easily let out, like near a major train station or in a desirable area and be willing to reduce the rent. Not being able to find a tenant for a property near a major train station or desirable are even though you are flexible on the rental price. 3 Interest rate rises beyond affordability Fix the interest rate for the whole term of the mortgage. Nil. 4 Get caught in negative equity trap. Don’t sell the property and realise your loss. Continue to rent it out. Wait for the recovery and then sell. It never recovers and you have to sell. 8 Major repair becomes due and can’t afford to carry out works Take out a thorough and comprehensive buildings and contents insurance as well as specific policies for specific items. The policies don’t capture something you hadn’t thought of. You have to make an estimation of how likely these fears will materialise and are the rewards in investing in a property pension are compensatory enough. If you are happy with this overall fear then you will invest in property. If you are not then you won’t. If you are not happy with the overall fear then I suggest you take more countermeasures so that your overall fear is reduced. Reduced to a level that you are happy with so you are comfortable in investing in property. So in summary you can either add to your fund or wait. These are the only two strategies you have! Well I’ve laid out both arguments for you but its for you to come to a decision. Do you think property is better than traditional pension funds? I really want you to study this chapter as this is key to your motivation to build a property pension. 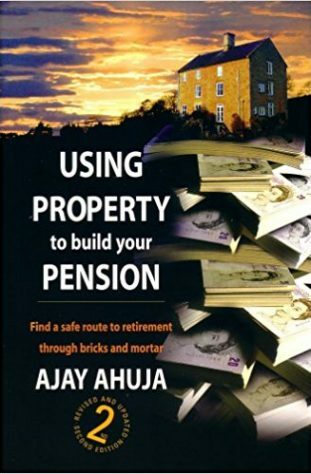 Once you are convinced the motivation to build a property pension will be there. This is because you understand the uniqueness of property and how property is a superior investment to virtually any of the other investments out there. The illustration above is only one strategy to achieve a property pension. There are many strategies you can adopt to achieve a retirement income but this all depends on YOU. It depends on how much you are willing to contribute, how much you want and when, your attitude to risk and your level of involvement. Lets look at this in more detail in the next chapter.